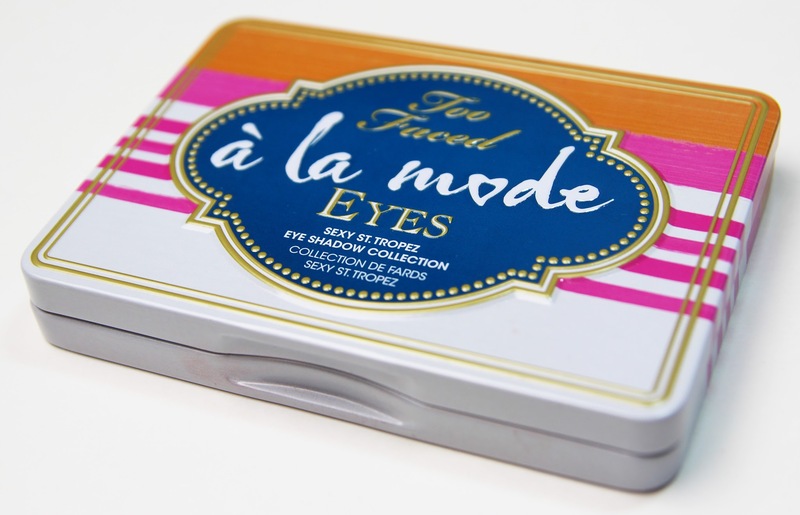 It's been a while since I bought a "high end" palette, so when I saw this palette that Too Faced recently released I knew at first sight I had to get my hands on it. I posted a stock image on Facebook and one of my followers, Stephanie, told me of a amazing deal where I could get this palette for 29$ shipped! When you can get a discount on a product on your wish list it is really hard to put down your wallet, so naturally I placed an order! This palette is eye candy for me. I love the neutrals with the mix of brights, it's reminding me that summer should be here in no time. 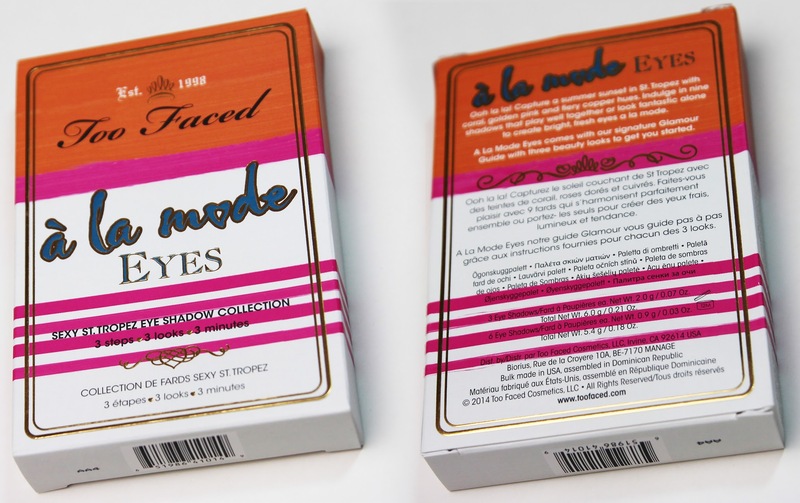 The Too Faced A La Mode Eyes Palette comes with nine gorgeous shadows: Three in larger pans, the highlights, and 6 in smaller pans, the gorgeous colors. 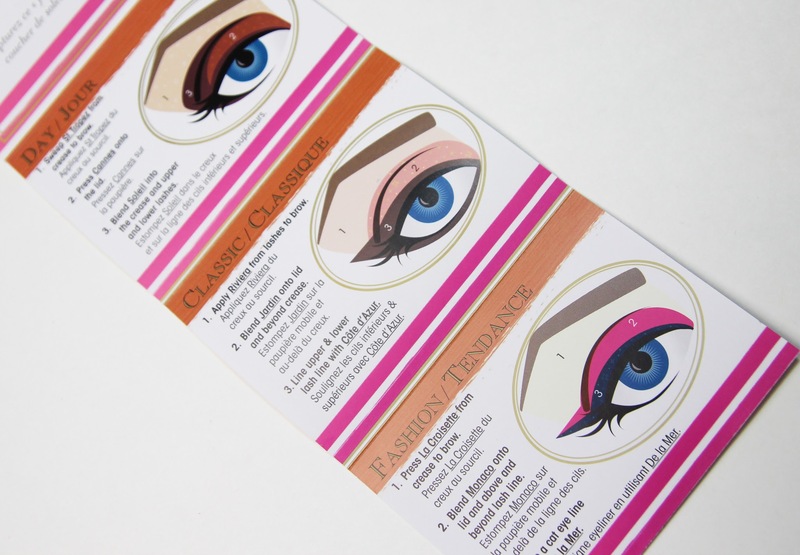 The palette is broken up into three sections, each having a coordinated look in the booklet that you can follow along with. I actually used the booklet to create a look and it turned out quite pretty: tutorial in the future? Overall the colors in this palette are of the shimmery, satin finish and are mostly all warm tones. 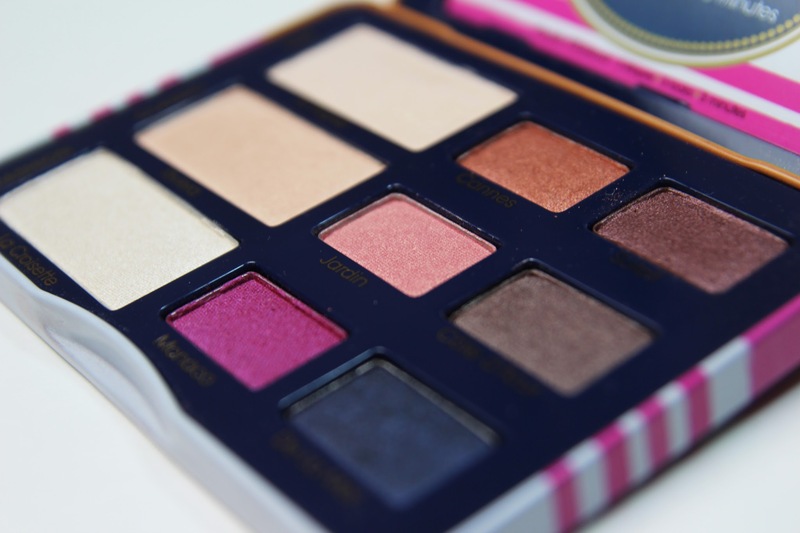 Usually I go for palettes that have a cooler, matte selection of colors: but we all need to try new things: right? When I first looked at the palette in person I felt immediately disappointed in the highlight selection, at first look they look very similar in color. 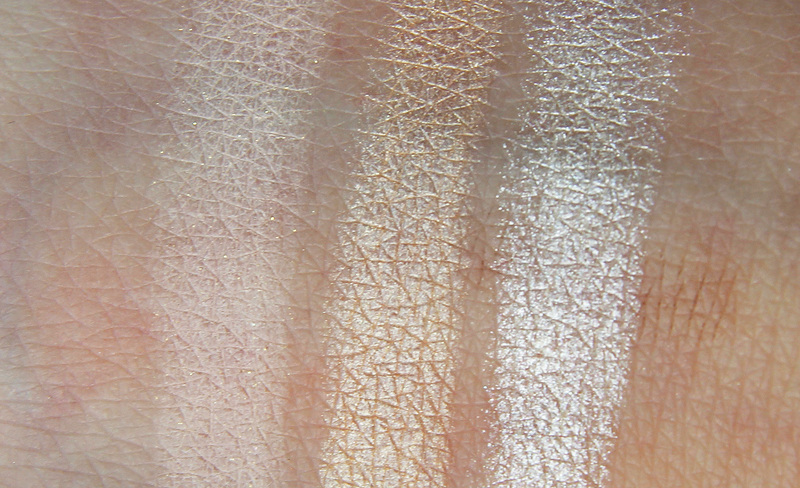 To my surprise when swatched and used the highlight colors are all VERY different: the first being a warm beige with a light golden sparkle, the second being golden beige with a more metallic golden shimmer, and the last being a cooler white with a light gold shimmer. Each are very pigmented and work great as highlights, might actually be my favorites of the palette! When it comes to the six smaller shades I was equally impressed. You get an array of colors (as show above), ranging from brights to neutrals. My favorite shades are probably Cannes (a warm orange copper color) and Cote d'Azur (a gorgeous warm brown). 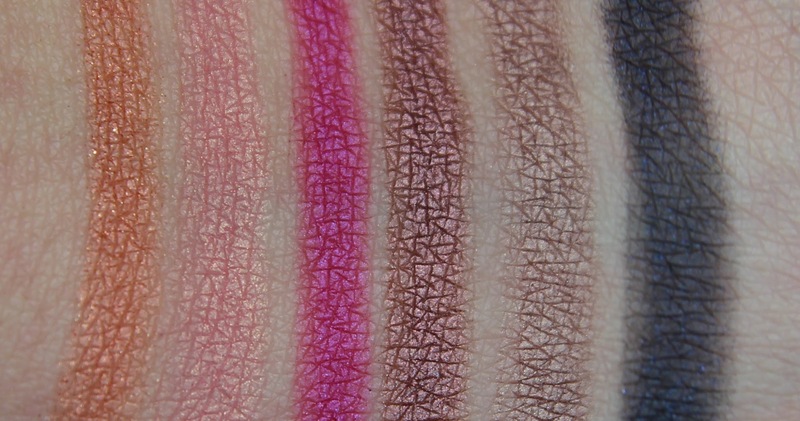 I also want to mention how fun the pink is, I am excited to incorporate it into my spring and summer looks! My least favorite shade has to be De La Mer (a cool navy with dark shimmer) is was a lot less creamy in texture, quite powdery. Through out all the shades there was a light powdery texture, but that didn't impact the color payoff and blendabilty for the majority of the colors. In conclusion I would really recommend this product for anyone who loves neutrals and pops of color. You can achieve so many looks with this palette, and the price point is perfect for all of the shadows you get. Bring on summer! 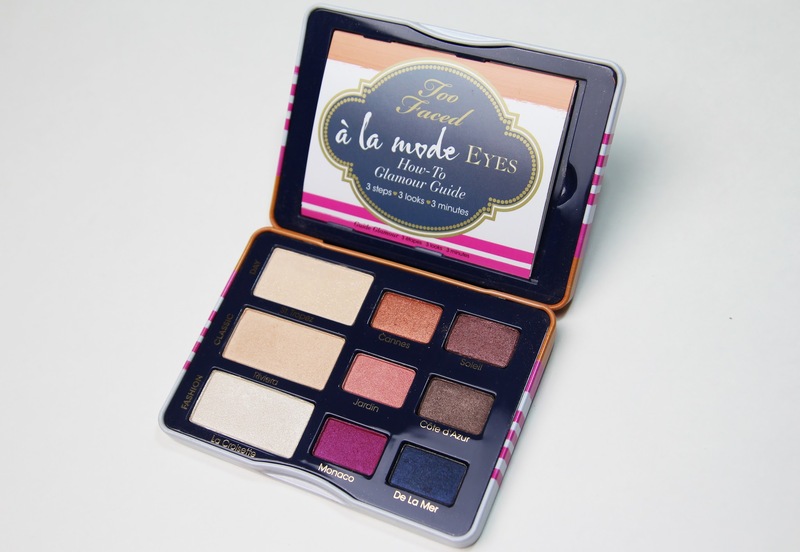 Available from toofaced.com for $36.00.